Binon studied with the sculptor Joseph Chinard (1756-1813) in France and was the American sculptor Horatio Greenough's first teacher. 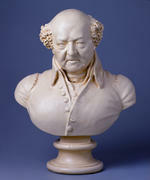 Binon sculpted a marble bust for Faneuil Hall and hoped to sell plaster versions for profit, although Adams thought it "so hopeless a speculation. "3 Binon made at least six plasters, including those given to Adams, his son John Quincy Adams, the Boston Athenaeum, and Jefferson. Dimensions 25 x 14 x 20 in. Cited in Andrew Oliver, Portraits of John and Abigail Adams, 180. John Adams to Thomas Jefferson, 29 May 1818, Lester J. Cappon, The Adams-Jefferson Letters, 526. John Adams to John B. Binon, 7 February 1819, cited in Andrew Oliver, Portraits of John and Abigail Adams, 185.